Diane shows off our both and the wonderful artwork created by the kids that stopped by our activity area. World Cruiser Team Member, Good Friend, and Aviation Educator Laureano Mier brought his model all the way from snowy Wallowa, Oregon. This framed photo of Lt. Erik Nelson (pilot of the World Cruiser New Orleans) was brought to the show and donated by Erik’s godson, Erik Splawn! 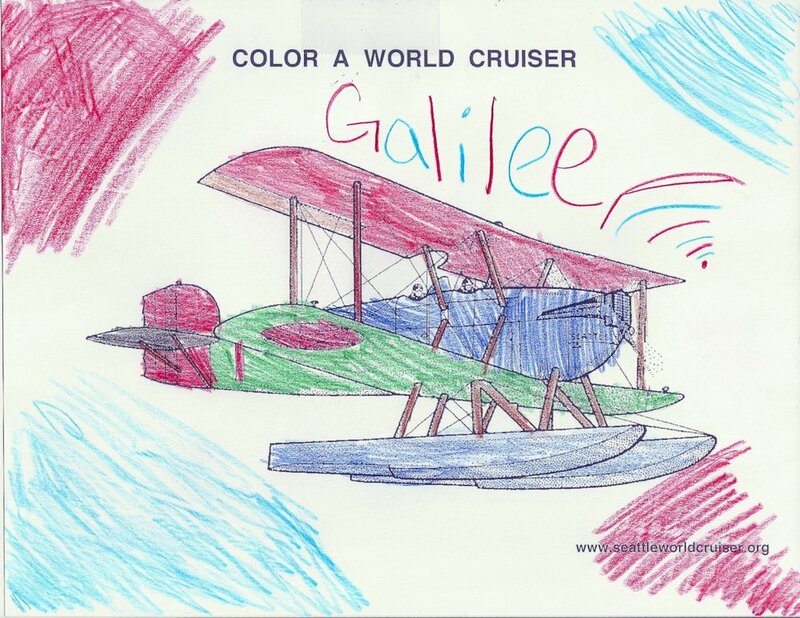 Keith Littlefield, pilot and longtime World Cruiser supporter, shows his enthusiasm for our project! Rachel Hansen and her family. Rachel is Washington Aviation Association’s NW Aviation Conference and Career Forum Trade Show Coordinator. Everyone worked diligently to make this event a great and very well attended event this year. Meemo, one of Laureano Mier’s monkey “kids," who always seem to be into anything that’s happening. 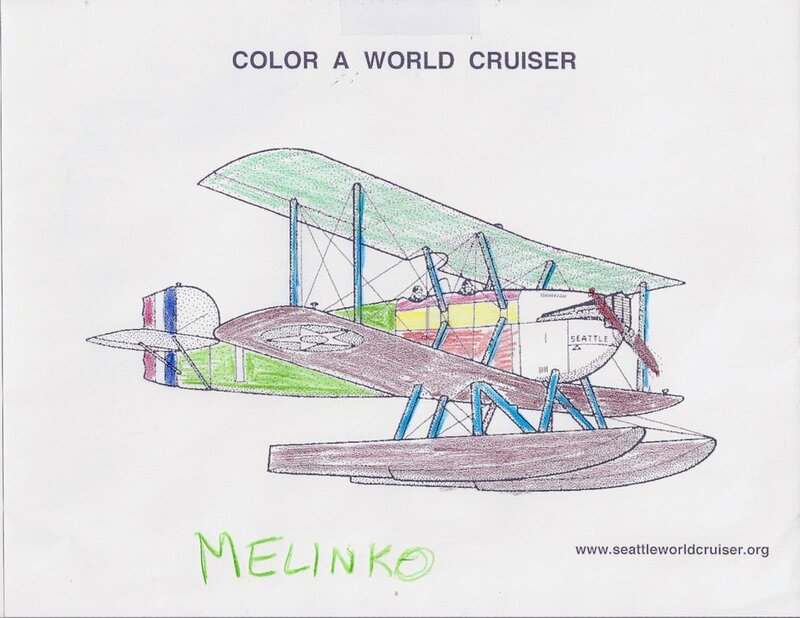 Meemo is “manning” or “monkeying around” at the coloring table—and one of our official greeters, when he’s not sitting in the World Cruiser model cockpit, that is! Isabelle shows off her wonderful artwork. A big thank you to all of you that came by to visit us at the conference this weekend. It was great fun, and was so nice to meet so many new faces and chat with old friends. We appreciate everyone’s enthusiasm about the project. And a big thank you again to the conference for featuring us in this year’s program. If you didn’t get a chance to pick up a copy, we’ve provided a download link below the cover image. As 2018 draws to a close, we want to pause to thank everyone that has been following our progress, cheering us on, and volunteering their time and energy to make this such a wonderful year for the Cruiser. We’ve made some tremendous progress this year and are gaining some great momentum as we head towards the new year and new adventures. After much work, preparation, and planning we are happy to report that we have started the seaplane phase of our flight test program. We are very pleased with how she’s flying with the floats, and are anxious to continue putting her through her paces. 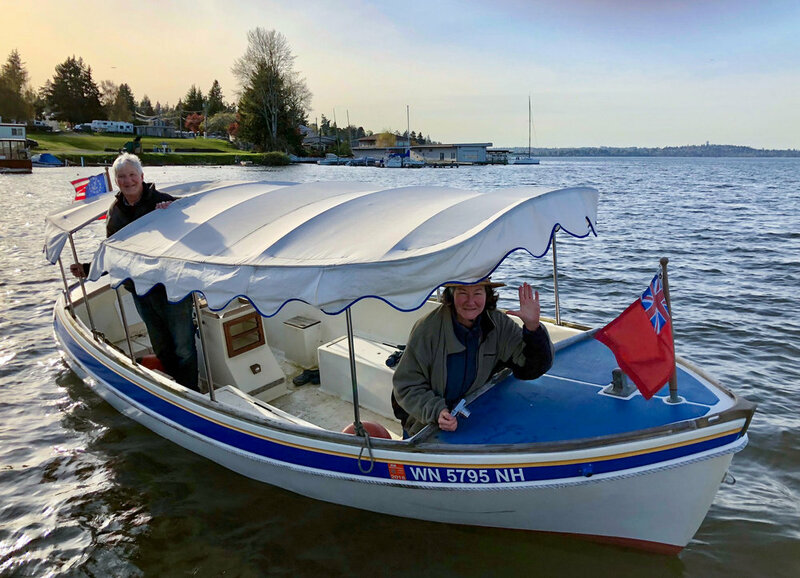 “ Our first excursion onto Lake Washington (April 9) was to really work with the basics. The only squawk we had was with the intercom which I was able to sort out the next day. We realized we would have to have a more permanent launching system. James Young turned me on to an ingenious Otter lift platform that Rust’s Air Service, in Anchorage had come up with. I went up to Anchorage Aviation Trade Show and talked to folks about the logistics of going out the Aleutians, and Colin Rust allowed me to photograph and take measurements of their neat solution for a lift platform. On our second foray onto the water, (September 18) we used the beaching gear for the last time—and it was a real challenge because the level of Lake Washington was at record lows and Mitch and I had to wade out into the mud to get the tail wheels off. By now, the dock crew was well-versed and things went smoothly. This was, also, our second fuel load test, as we are working our way up to full gross. Thanks to our skilled and dedicated crew of volunteers the Cruiser has been “like a duck to water” with the new pontoons. 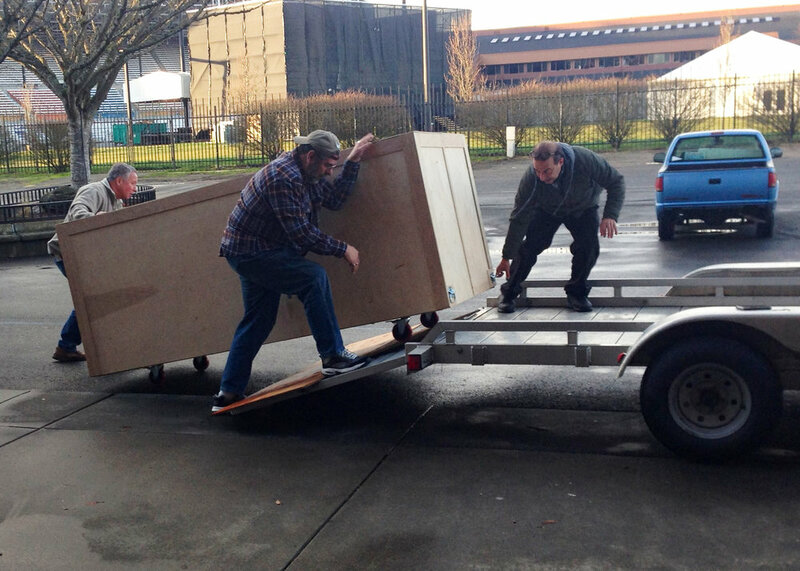 Many thanks as well to the great folks at the Renton Airport for their continued support of the project. Gary, Mitch, Meemo (in flight jacket) and Melincko. 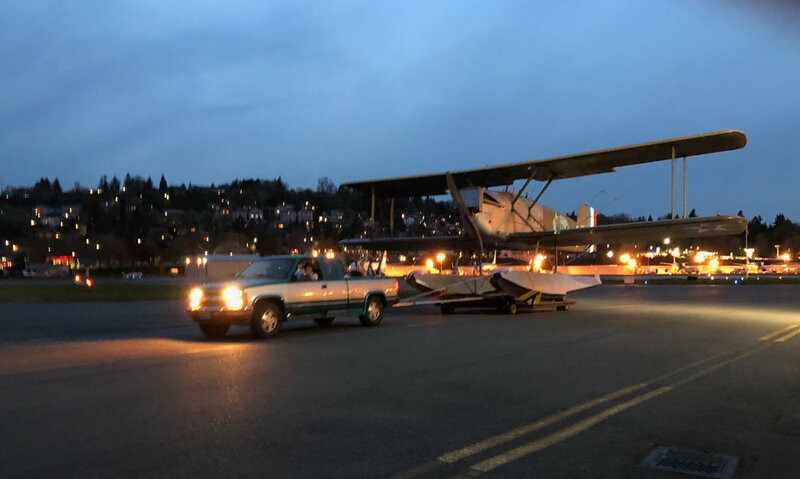 Bob Rhinehart, driving Seaplane Scenics float truck. Moving the Cruiser down the ramp with the beaching gear wheels. Laureano wheeled the beaching gear off the ramp as Bob and Mitch got them removed from the floats. Gary’s Support Boat, with Mitch, Kent, and Laureano crew. James Young, Bob’s seaplane instructor for the float trials. Bob adrift…How about a pull to the dock gang? James tugs on the stern line and gives instruction to the bow crew. Captain John Hope is up for some adventure, as photo/safety boat. Navigator Joellen keeps them headed for the Renton seaplane dock. Flying Cuban: Bob points to the remarkably durable cigar, still waiting for him, after a flight around Mercer Island! During our 1996 Super Cub trip we made a stop just north of Okinawa, on the beautiful island paradise of Amami Ōshima. While there, we were fortunate enough to meet and become friends with Motohide and Tomoyo Harada. When we returned home we sent their son, Masahiro, a model of a Douglas World Cruiser. Now a 19 year old, Masahiro has recently visited from Japan. We were delighted to visit with him for a few days as we immersed him in all things airplane—of course! 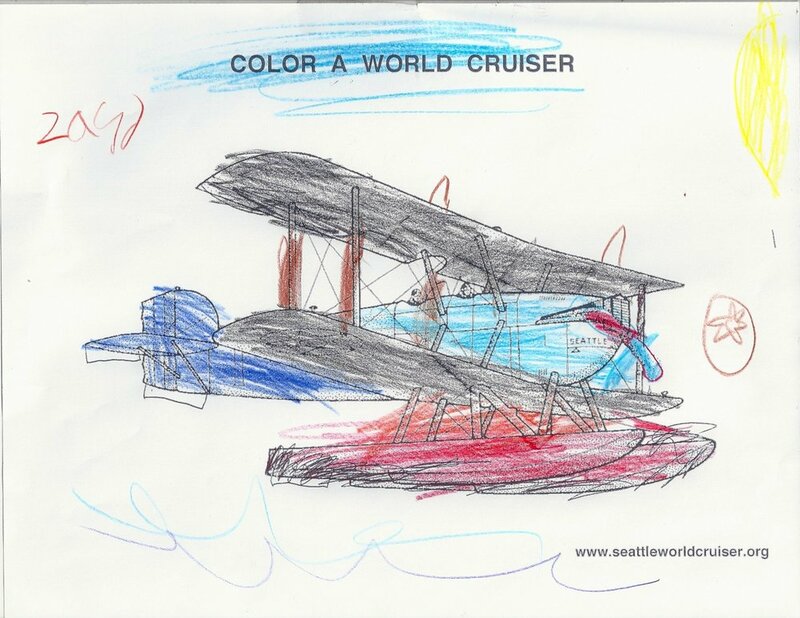 A number of years ago Ryan Zulauf, former Renton Airport Manager, and his son Cole built a model of a World Cruiser. Cole recently stopped by the hangar to visit with us and share this great photo of he and the model they built. Masahiro, with a photo of his younger self holding the model he and his father built in front of Bob’s full scale model of a Cruiser. 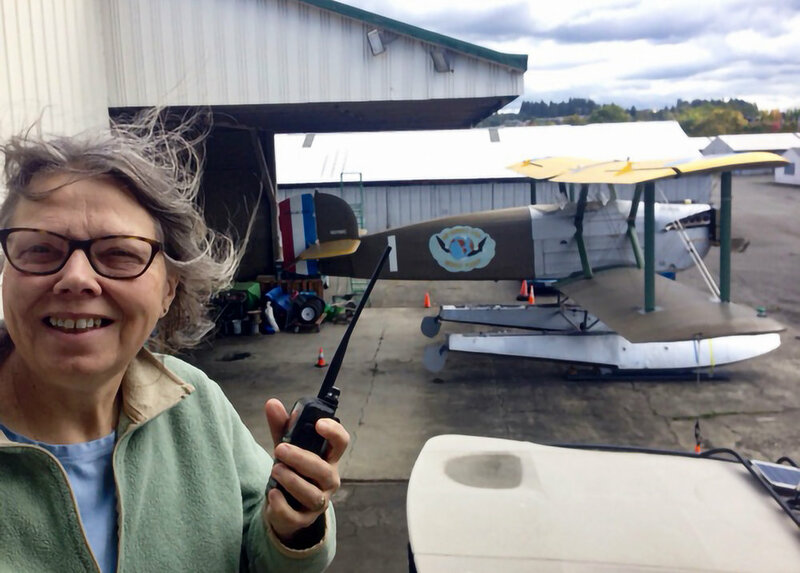 Diane was recently awarded her EXTRA class amateur radio license, which she will use on the World Flight. On October 2nd, Diane KI7USH made her first contact from Seattle World Cruiser World HQ to Mike KA7CSE. 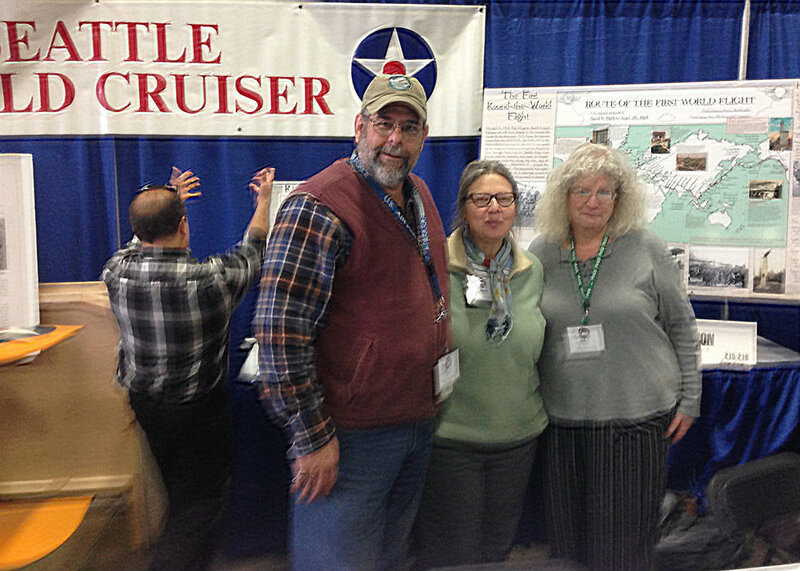 The Northwest Aviation Conference and Trade Show, organized by the Washington Aviation Association, took place on the weekend of February 24-25 and the Seattle World Cruiser team was there! We had a lot of fun telling the World Cruiser story and our preparations for the celebration world flight. Thanks to all of you that stopped by and said Howdy, and a special thanks to Rachel Hansen and family for making this Premier Event happen in the Great Northwest. The crew with Rachel Hansen, the “spark plug” behind the scenes and in front of the NW Aviation Conference and Trade Show. Our booth before the crowds arrived. Display of the route and scenes of the 1924 flight. Our Crew: Guy Shinkaruk, Diane Dempster, Pat Monahan, and Laureano Mier with expressive hands! Laureano with a future astronaut and his DWC model on floats. Our friend, and Curator Emeritus at The Museum of Flight, Dennis Parks, stops by for a visit. Laureano with Malencko and friend exhibitor. Keith Littlefield helps Guy and Pat pack up the model. On the trailer for the ride home, Thanks Laureano! 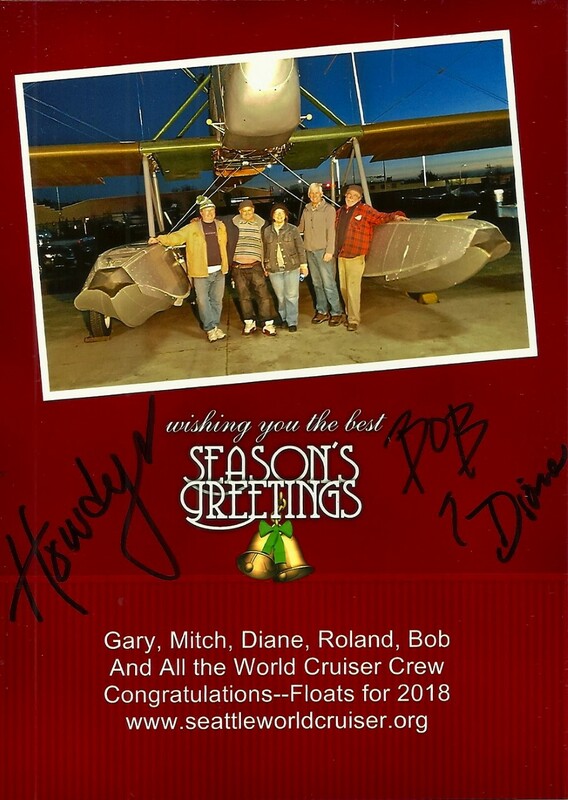 December 2017 - Season's Greetings from the Cruiser Crew! Another milestone for the project occurred recently, the installation of the floats! Many thanks to our volunteers for all their help. Click on the images on the lower right to enlarge them. Once we finish getting the floats securely installed we can begin planning for the next phases of our flight test program. Stay tuned! Roland Klix, Gary Carmichael & Bob. Gary Carmichael, welder, and Mitch Herrick, fitter, working on the float struts. Gary & Mitch, preliminary strut welding. Mitch, Gary, and Bob checking the strut angle. Bob on top of Cruiser, getting rigging prepared for lift. Note the hoist goes through the top wing tank. Bob on lift, checking hoist, Gary and Mitch in foreground. The wings are folded to get the plane in place under the hoist. We're very happy to report that our upgraded Liberty V-12 engine has arrived and is currently being installed in the Cruiser. We will be transitioning to flying the Cruiser on floats some time in August. To learn more about our Liberty engine click on the following link: Liberty Power. Be sure to pick up the October issue of Air Classics magazine. They have been kind enough to feature articles about our project as well as the history of the original 1924 world flight. The articles also showcase some beautiful air-to-air photos by photographer Jim Larsen that were taken on July 14th. The occasion was Diane's first flight in the Cruiser as our test pilot, Carter Teeters, flew from the Arlington Airport to Boeing Field for the Boeing 100th Celebration. Carter and Diane arriving at Boeing Field. July 2016 - Happy Birthday Boeing! 2016 is getting off to a great start for the project. Our test program has resumed and things are looking up! We are very happy to report that both plane and pilots are performing well. We will be continuing to methodically put the Cruiser through its paces throughout the year. There's more exciting developments in store for this year, so be sure to check back here in the coming months. A grandmother was riding on a mail sack an an open cockpit biplane. Cold and impatient at the progress, she shouts back to the pilot "Can't you go and faster Sonny?!" "Yes Ma'am," he replies, "but I'm supposed to stay with the airplane!" We're still with the airplane. Happy 2016 New Years to ALL! Bob receives the award at the Exhibits tent after the air show. The Mayor of Arlington graciously invited the Seattle II to the Arlington Fly-In this past weekend. We were at the static display around the Red Barn with the Boeing Model 40 and the Gee Bee Super Q.E.D. II. We're very happy to announce that the Judges voted us the Champion - Early Vintage Award winner. Congratulations to all of the volunteers and supporters of our wonderful project! Test pilot Carter Teeters & Bob. December 20th, 2014 was a historic milestone for the project, our first flight! Granted it was a short hop down Boeing Field, but as the saying goes, “a journey of a thousand miles begins with a single step.” This short flight was a very important step towards our ultimate goal of flying around the world. Thank you to The Museum of Flight and everyone that came out and braved the weather to join us. It warmed us to see so many of you cheering us on. We’d also like to take this opportunity to acknowledge our wonderful team of supporters and volunteers. You are what makes all this possible. Thank you! Video of the event can be viewed below. 2015 is shaping up to be a very eventful new year, so be sure to check back here for the further adventures of the Seattle World Cruiser! Image courtesy of Steve & Lynda Crider. We are delighted to announce that we've received our Special Airworthiness Certificate from the FAA and are now cleared to make out first flight! Please join us for this major milestone event Saturday, December 20th at The Museum of Flight. We plan to fly at noon. Bob will be giving a presentation inside the museum at 2:00 PM with a reception to follow. Bob with our Special Airworthiness Certificate. 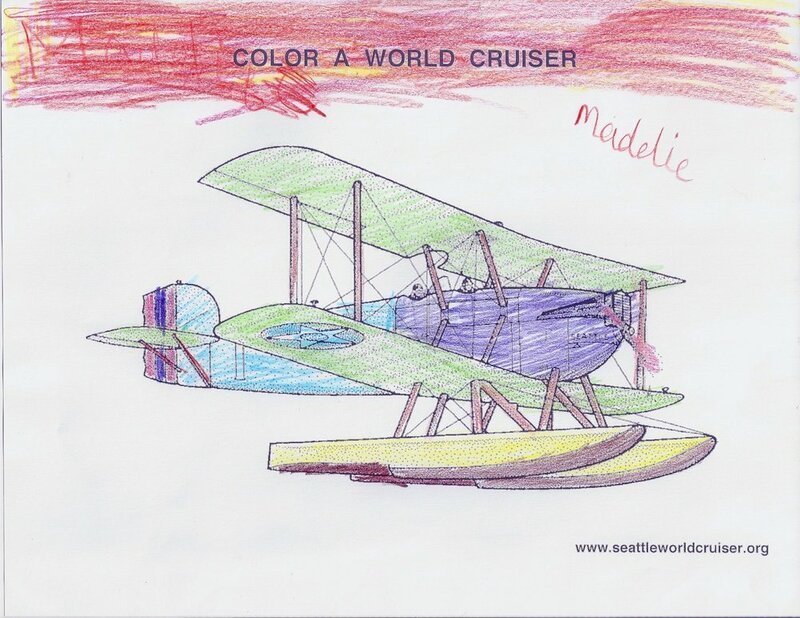 This year marks the 90th anniversary of the Douglas World Cruisers return to Seattle to complete the first flight around the world. An estimated 40,000 spectators were on hand at Sand Point on September 28th 1924 to welcome the fliers back to Seattle. After landing, the pilots and crew of the Douglas World Cruisers were whisked away to the official welcoming reception at the Volunteer Park bandstand. A mayor, governor, Admiral, General and ambassador all spoke. The Chamber of Commerce presented the fliers with rings made of Alaskan gold. They were also later awarded the MacKay Trophy for the “meritorious flight of the year”. Of the eight aviators that were part of the flight, two retired as major generals, one a brigadier general, one a vice president for Lockheed Aviation, and three as colonels. Of the six who circumnavigated, five retired from the military within three years. A generation later, four returned to Army Air Forces leadership roles for the duration of World War II.